I’ve been so into salads lately. It must be the summer weather! 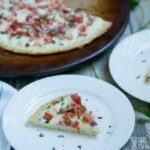 When it’s hot outside I like grabbing something quick and light that doesn’t require cooking. 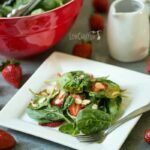 Salads are also perfect to take along to a picnic or outdoor gathering. If you don’t add any mayo or meat, they are good sitting out for a while. 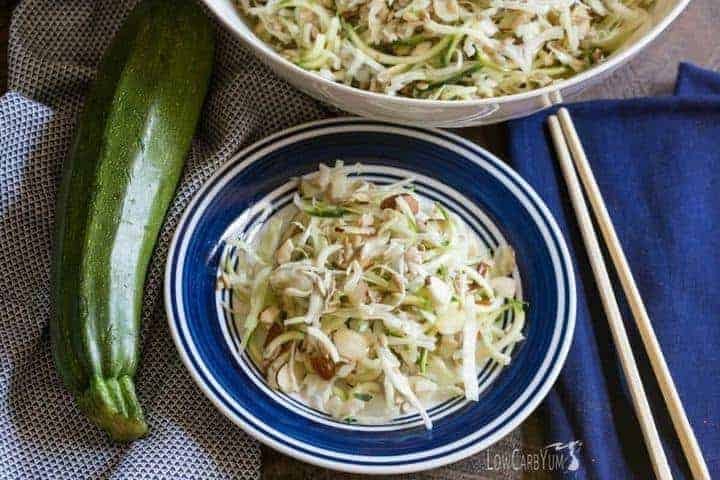 With that thought in mind, I made up this spiralized zucchini Asian salad that is perfect for taking along for an outdoor outing. 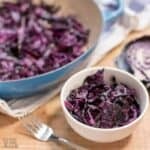 This is a great alternative to coleslaw. And, it’s super light, but has fat to help curb your hunger. I used avocado oil as it’s my favorite, but olive oil could be used instead. 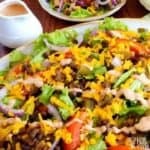 It’s a nice salad to serve with grilled meat. 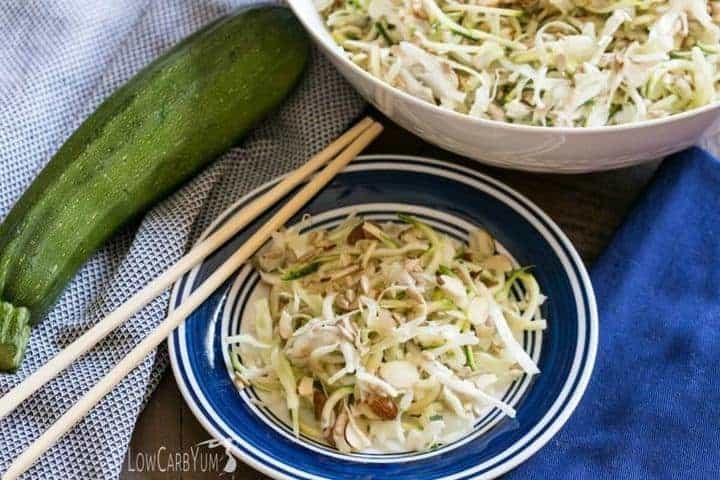 To save time, I used a bag of pre-shredded cabbage in the spiralized zucchini Asian salad. I small head of cabbage would be about the equivalent. 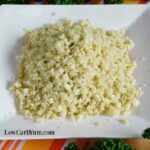 I just didn’t feel like pulling out the food processor and cutting board to chop and grate a fresh head of cabbage. The inspiration for this dish came from ramen noodle salad recipes like these. They are all very similar. Rather than use the high carb noodles, I spiralized zucchini instead. You’ll still get crunch from sliced almonds and sunflower seeds. I thought the spiralized zucchini were too long so I used some kitchen shears to cut them up. You could use a regular kitchen knife, but the shears are a lot safer. I’ve been known to slice my fingers while chopping veggies. The carb count per serving may seem high for some, but half of the carbs are from fiber. That means it won’t have the same effect on insulin as sugar carbs. 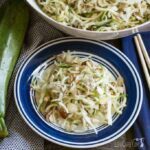 Plus, you are getting all vegetables, nuts, and healthy fats in this spiralized zucchini Asian salad! I couldn’t decide on what kind of vinegar to use in the salad. I ended up using plain white vinegar, but cider vinegar or rice vinegar would also be tasty. 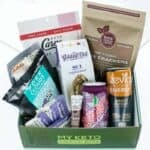 It all depends on the flavor you want and what you have on hand. Our garden hasn’t produced any zucchini yet, but I’ll keep this recipe handy for when it does. I really enjoyed the salad and will likely make it a couple more times this summer. 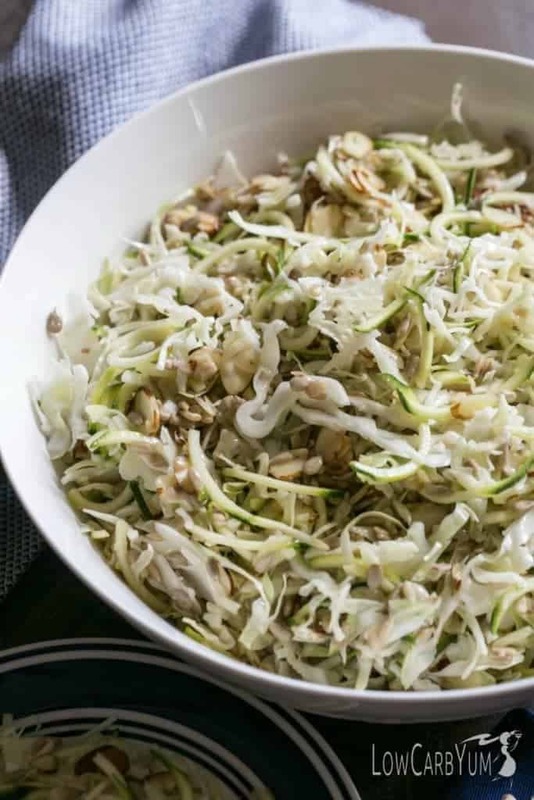 If you’ve got a lot of zucchini coming out of the garden, you may want to try some of my other spiralized zucchini recipes. 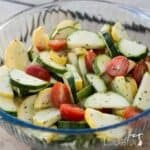 I’ve also got a Greek Salad made with spiralized zucchini here and a spiralized zucchini casserole here. 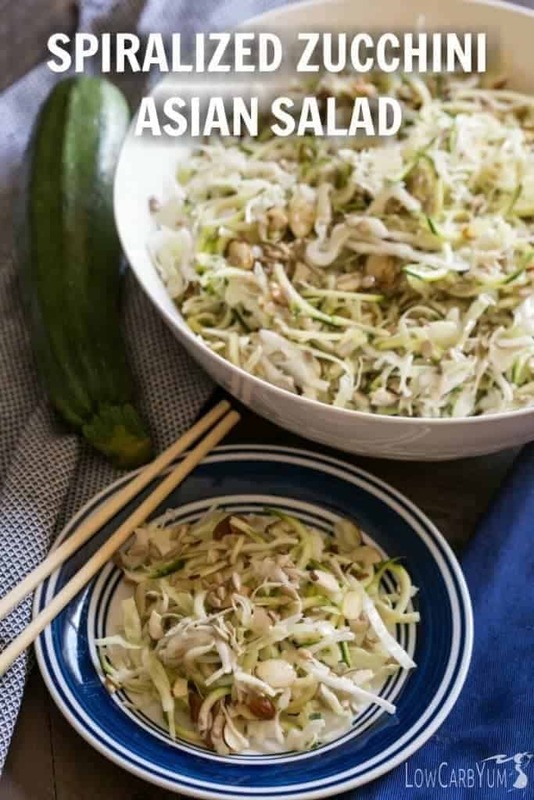 You'll enjoy this refreshing spiralized zucchini Asian salad on those lazy hot summer days. No cooking involved. Just mix and chill this side dish. 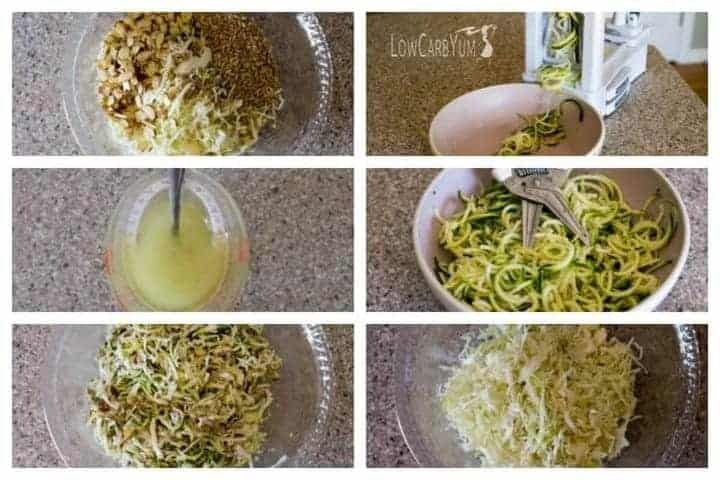 Cut the spiralized zucchini into smaller pieces with kitchen shears or knife. Set aside. 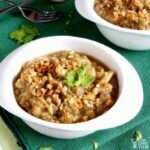 In large bowl, combine cabbage, sunflower seeds, and almonds. 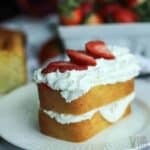 In small bowl, combine oil, vinegar, and stevia with fork or whisk. Pour dressing over vegetables and stir in. Chill for at least 2 hours before serving for best taste. You can use a knife to put slits down the length of the zucchini before you spiralize it so the noodles are shorter. I would slit it on both sides but if you want shorter noodles, you could put 4 slits in the zucchini. 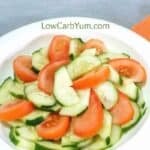 Hi Lisa, I just wanted to let you know I featured this recipe in my Low Carb Gluten-free Zucchini Recipes roundup. I hope you’ll get some visits coming your way!